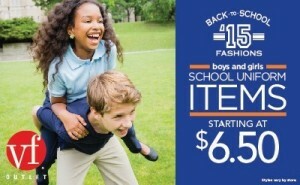 If you are a Cole Haan addict like me, you will want to take advantage of this offer! 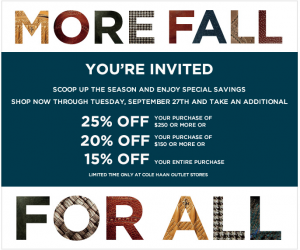 Scoop up the season and enjoy special savings at Cole Haan Outlet Stores. Shop now through September 27th and receive 25% off $250 or more, 20% off $150 or more, or 15% off your entire purchase. To print this offer, click here.